For those wondering, hes had some neck issue for awhile now which required multiple specialists to weigh in. He will be a good backup for PJ with a chance to earn more minutes. I’d love him in Portland. He would be perfect for Portland, but Sac town should make a run at him. Morris and Barnes would give them some so much lineup flexibility at the SF/PF spots. P he is one of hardwns best buds in the league. cc Is a done deal. Bookmark it. Is he saying the Lakers are a playoff contender? P. We switch everything on D. That’s how you beat GSW. Make them beat you one on one and limit the open threes. in a game of one on one hardwn is king. that’s how they pushed GOAT to 7 last year. Only a injury from Chris stopped Houston from beating the best team in nba history. Only a injury from Chris stopped Houston from beating the best team in nba history. CC laid out the blue print to beat them. No one else has even avoided g sweep since Kevin went there. That trend will probably continue this year won’t it. Although cousins is looking to be a net negative isn’t he. Shams - Free agent Markieff Morris has agreed to sign with Oklahoma City, league sources tell @TheAthleticNBA @Stadium. I forgot to come back and update. CC got word on another player who will be bought out soon that they favour over Morris. 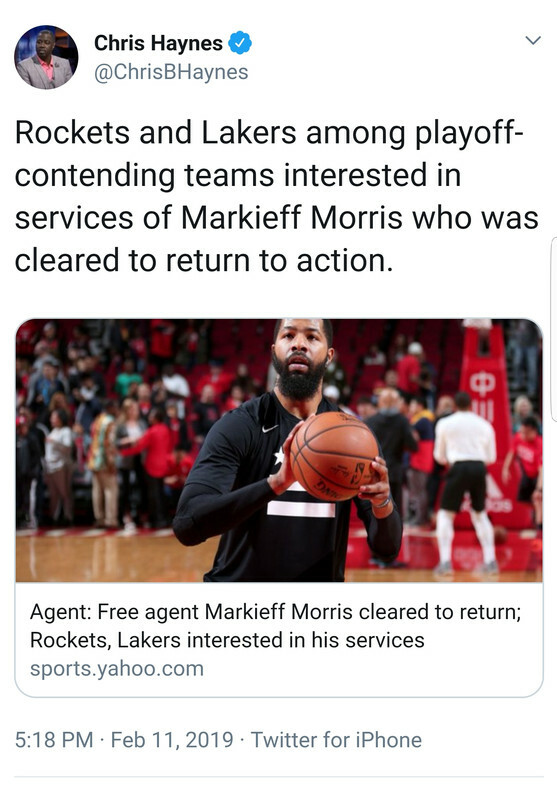 so they let Morris go. The name will be made public when he agrees to his buyout. Will be in the Next two weeks.